It is raw, organic, unfiltered and contains mother of vinegar. 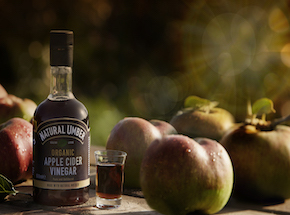 Unlike many other cider vinegars, it can actually be taken as a drink because of their unique fermentation process. It retains the natural sweetness of apples and tastes delicious. It comes from the Mackle family in County Armagh. They have been growing apples for more than 50 years. They have 350 acres of orchards and are one of the largest apple growers in the UK and Ireland. This vinegar is their own creation. Use it as a drink, as a dressing and so much more. Customers say it tastes great and has many health benefits. 3 stars in Great Taste Awards 2018, Golden Fork for Northern Ireland.